We know there are a large range of consumers who love displaying their photographs, but with this large diverse group we also know that everyone has different tastes in regards to size, placement and quantity of pictures they would like to display. 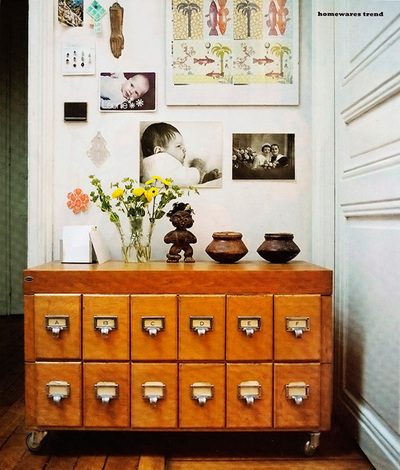 This idea is perfect for the photo lover who wants a simple yet dramatic look. With smaller sized images and a combination of a few other art pieces, you can create a big impact in a small space. This idea comes from an Australian Magazine called Inside Out and shows a unique way to hang a display in a very small area such as a walk through or small nook. This is a great display option when you don't want an overwhelming display that takes up main areas. Essentially, you are creating a mini gallery look in your own home by incorporating a variety of prints and art. With this type of display, called a gallery display, you want to start your display at eye level and put pieces along this line as well as right above and below the line. It is important to allow the pieces to stagger, and be sure not to hang the pieces too high. For this type of display feel free to mix and match B&W pictures with color or sepia for a whimsical touch. Have images mounted to a backing that you can adhere to the wall as opposed to using frames for a more gallery like look. What do you think about this display idea? Love it or hate it? We would enjoy seeing what photo lovers really like!